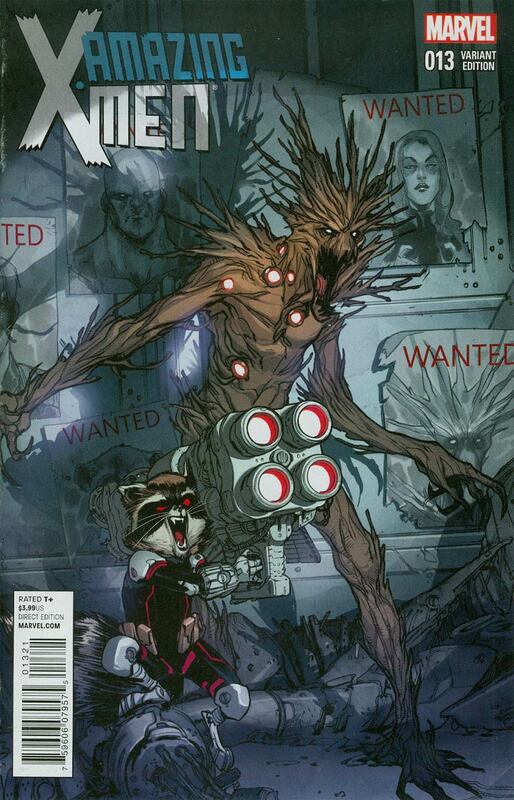 Cover by Sara Pichelli, an awesome Uncanny X-Men 141 cover starring Groot and Rocket! I thought this issue own a slot on the X-Books 2014 Best Storylines from a Single Storyline. Instead, James Tynion IV won Honorable Mention for best writer for this very well written Done-In-One. The main plot of this book, is that Anole is suppose to go out on a blind date with a dude. The guy knows he is a mutant but Anole worries as he isn’t one of the ‘pretty mutants.’ The poor guy is concern about his green skin, giant one arm and making a good impression. Lady Mastermind messes with Anole’s head. We get good moments with Northstar and Nightcrawler, two characters that I haven’t seen interact too much over the years. Northstar gave Anole a pass to be gone for the entire day, Nightcrawler is more by the books and is concern about Anole – as he has been gone too long. Lady Mastermind shows Kurt being young and treated like a demon, his father Azazel shows up. This doesn’t work on Kurt, as he is so beyond this phase of his life. Northstar’s nightmare is his husband (glad they are together) – Kyle, turning his back on Northstar. We see that Northstar’s inner Nightcrawler is homophobic. Real Kurt kills this illusion, as he is super gay friendly. Anole gets to punch Lady Mastermind, who I like this power upgrade, it seems like it is an obvious direction for her. Especially as she states that she has been training with telepaths, so she has earned this upgrade. Kurt gives some great advice how he is blue and furry and he does great with the ladies. Issue ends with the dude going on a date with Anole.